For an outdoor area sure to impress your mates, you need a RYOBI 36V hedge trimmer - this dependable machine will help keep your hedges in top shape all year round. Whether you're looking to carve impressive shapes or simply want to keep your shrubbery under control, you're sure to love the results you'll get with one of these tough power garden tools. Our hedge trimmer is the perfect addition to any 36V garden tools collection, as it is compatible with any RYOBI 36V lithium battery pack. This means you don't need to battle with cords or petrol as you tidy up your yard - you only need to experience the power and productivity of the battery, as well as enjoy the increased mobility and freedom. At RYOBI, we understand time is precious. That's why we manufactured our hedge trimmer to have a bar length of 600 mm and a cut capacity of 24 mm, so you can get the job done quickly and effectively. The rear rotating handle leads to less user fatigue and the detachable HedgeSweep helps you achieve a clean cut every time. The 2 Speed gearbox also allows greater control. 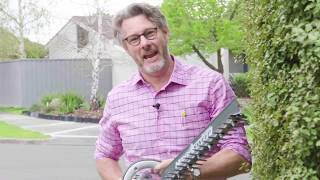 Before you trim your hedges, be sure to stop by your local Bunnings Warehouse to purchase the 36V hedge trimmer. You can also take a look at our other tools and hardware which are perfect for tackling a range of jobs around your home.